Chopped chicken in a sweet & tangy sauce with crunchy chestnuts are spooned onto a crisp iceberg lettuce leaf and enjoyed by hand. They are a popular menu item on P.F. Chang's, a well known restaurant chain that offers Asian culinary specialties. 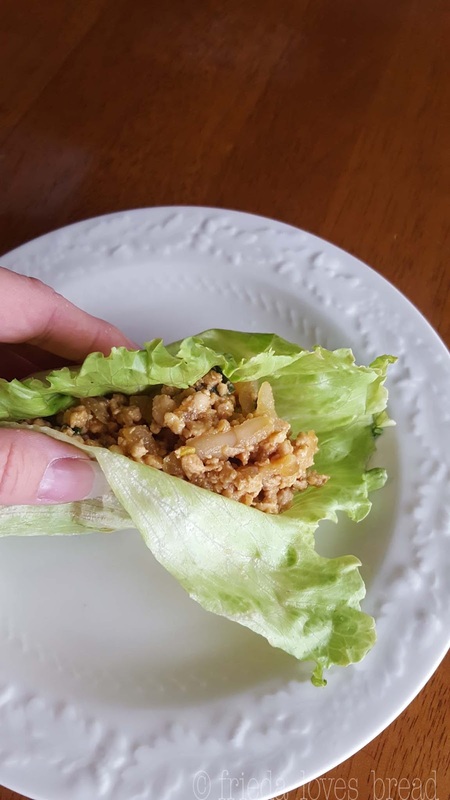 Their lettuce wraps is based on a family recipe secret that hasn't changed since it was first put on the menu. There are many variations of this recipe, so this is one that is a combination of several recipes. 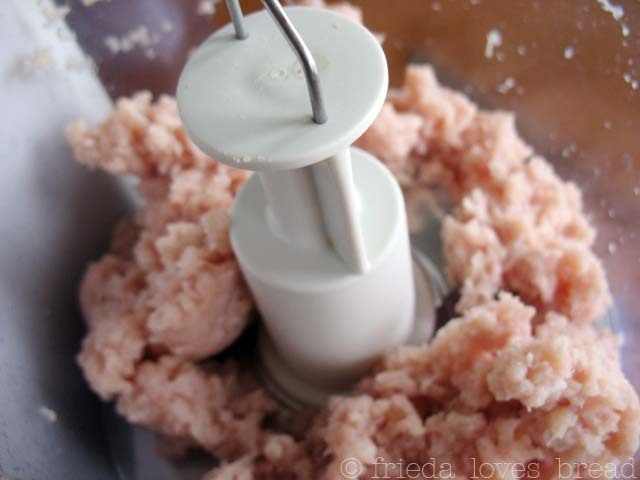 It uses ground chicken, but you can take boneless, skinnless chicken and use a food processor, manual chopper or dice the meat after it has cooked. If you have a Pampered Chef chopper, that will work, too. I have used my trusty Cuisinart food processor to chop pepperoni for my Manicotti tomato sauce, and for grinding pork/turkey for Swedish Meatballs. Chop up your meat and give it a couple of pulses and it's done. It's a great alternative to purchasing ground meat at the store. Purchasing your meat ground at the grocery store will save you time and dishes! This recipe uses Hoisin sauce, a sweet, spicy sauce that is made from soybeans, vinegar, & spices. It is widely used in many Asian dishes and can be found in the Oriental aisle of your grocery store. You will also find rice wine vinegar there as well, which is included in this recipe. Freshly grated ginger is SO wonderful in any recipe that calls for it, especially this one. I peel my ginger root, freeze it, and grate only what I need with my microplane/zester/grater. No thawing out necessary and once you try fresh ginger, you'll never go back to dried or powdered. My boys love Sriracha sauce, a hot chili dipping sauce that is popular in Thailand/Vietnamese recipes and is a good addition here, if you like a little kick. It has the heat, but not nearly the level of vinegar that some other hot sauces have. This recipe comes together very quickly, easily, and can be ready to enjoy in under 30 minutes. Enjoy eating out at home! Sweet & tangy sauce with ground chicken are spooned into a crisp lettuce leaf and enjoyed by hand. You can save time by purchasing ground chicken at the store. Hoisin sauce is a sweet, spicy sauce made from soybeans, vinegar, & spices and can be found in the Oriental section of your grocery store. Sriacha is a hot sauce that is optional. 1. In a large skillet over medium heat, add the cooking oil and onion, stirring until soft and translucent. 2. Add your ground or diced chicken and cook till browned, about 2 minutes.3. In a small bowl, combine hoisin, soy, & sriracha sauces, rice vinegar, ginger, and sugar. Mix well.4. Add sauce to meat mixture and stir. Add mushrooms, water chestnuts, and garlic, stir until heated through and aromatic. 5. 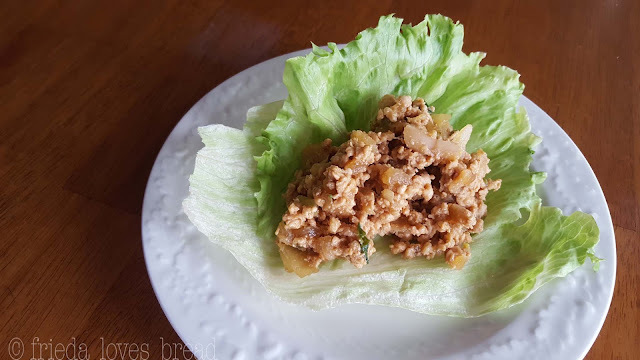 Spoon chicken mixture onto a large, single lettuce leaf, cup into hands and enjoy!